Eldest son of Thomas Beaumont of The Oaks, Darton by Anne, daughter of Edward Ascough of Louth, Lincolnshire. Educated at University College Oxford 1777. Inherited a modest estate of 450 acres in Darton, Yorkshire from his father some time between 1783 and 1785. He held the rank of Cornet in 58th Foot and 22nd Dragoons until his regiment was disbanded in 1783. Married Diana, illegitimate daughter of Sir Thomas Wentworth Blackett Bt. on 28 July 1786. 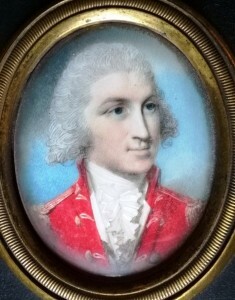 The Beaumonts inherited Sir Thomas’s Yorkshire estates and the Blackett lead company together with associated estates in Northumberland upon the death of Sir Thomas in 1792. Their principal residences were Bretton Hall in Yorkshire and Hexham Abbey, Northumberland. In 1794 T.R. Beaumont attempted to resume a military career when he was granted permission to raise a corps of light horse, of which he was temporarily appointed lieutenant-colonel commandant. He appears to have seen little active military service although in 1800 he was given a command in Limerick, Ireland under Lord Cornwallis (Diana Beaumont to J.E. Blackett 27 December 1800). Beaumont was elected unopposed as MP for Northumberland in a by-election of 1795 and continued to represent the county until 1818. There is no record of him speaking in the House of Commons where he was a poor attender, at least in part because of health problems. He was unsuccessful in his application for a peerage.